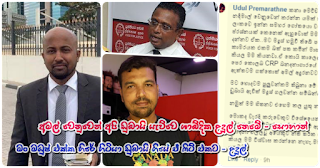 Attorney at Law Udul Premaratna travelling to Dubai saying that he was to appear on behalf of Amal Perera and Nadeemal Perera who have taken into custody has come in for various forms of criticism. Law Shabdika Wellappili who officially represents their family and that permission was obtained across the Foreign Ministry and as such he was sent to Dubai in this manner. 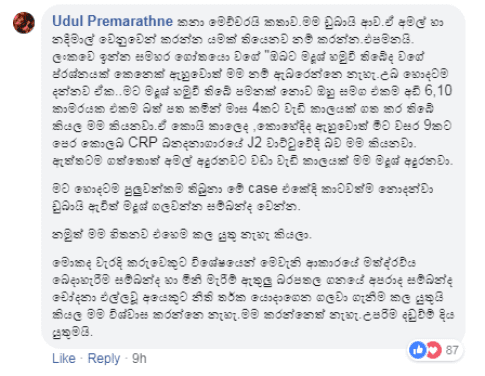 What Attorney at Law, Udul Premaratna said after going to Dubai was that he also is attending to that task. What is observed in that instance is that he apparently has participated voluntarily in this affair. It is felt that he has gone to Dubai either at his own expense or at the expense of an organisation he represents. "This is the only story. I came to Dubai. That was to do something on behalf of Amal and Nadeemal if there is anything to be done. That is all. Like some of the 'gothayas' in Sri Lanka, if somebody asks a question like, "have you met Madush?" ... I will not shay away. You very well know that. Not only I have met Madush ... I will say that I have spent a time of over 4 months in a 6 by 1 cell sharing the same meal of rice. If I am asked during what period ... where ... I will say, 9 years before this in ward 12 at CRP Prison. Actually speaking, I know Madush for a longer period than I know Amal. I had the best opportunity of coming to Dubai without the notice of anybody and get myself involved in saving Madush in this case. But I think that I should not do so. Because I believe that a person who has been accused in connection with particularly distributing this kind of narcotics; homicides including crimes of a serious nature is to be saved by bringing forwarded legal arguments. The maximum penalty should be given".